All of these items can be purchased from The Home Depot. For the sides of the dinnerware caddy, I marked my 1×10 boards at 11″ for the length. On each side, I made a mark at 3 1/2″ to match the 1×4 sides. 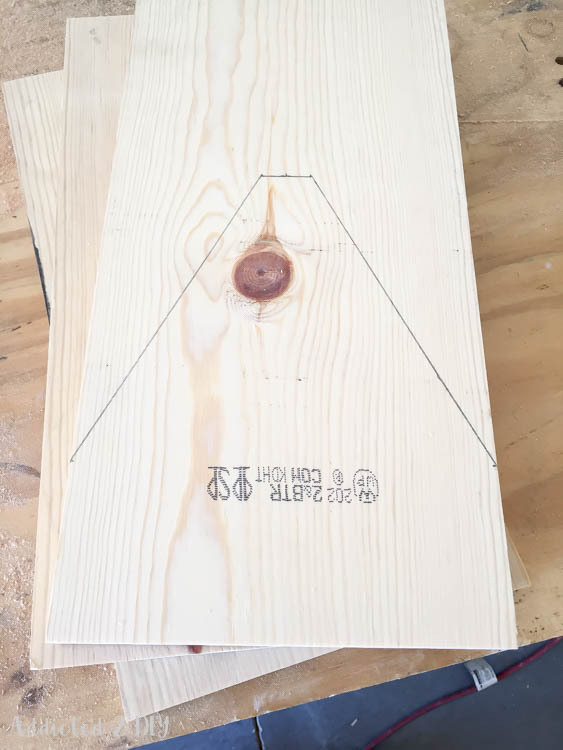 I wanted the squared off top of the sides to be 1 1/4″ wide, so I found the center of the board and marked the 1 1/4″ top from there. 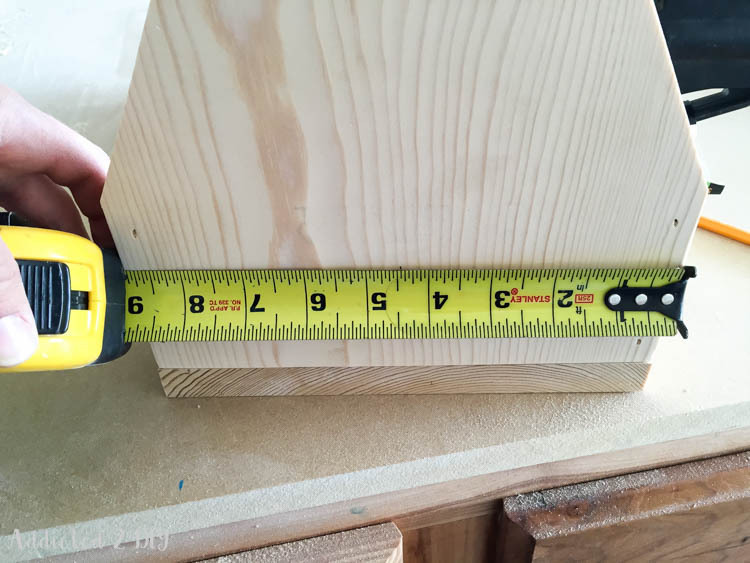 I cut each of the sides down on my miter saw following my pencil marks. 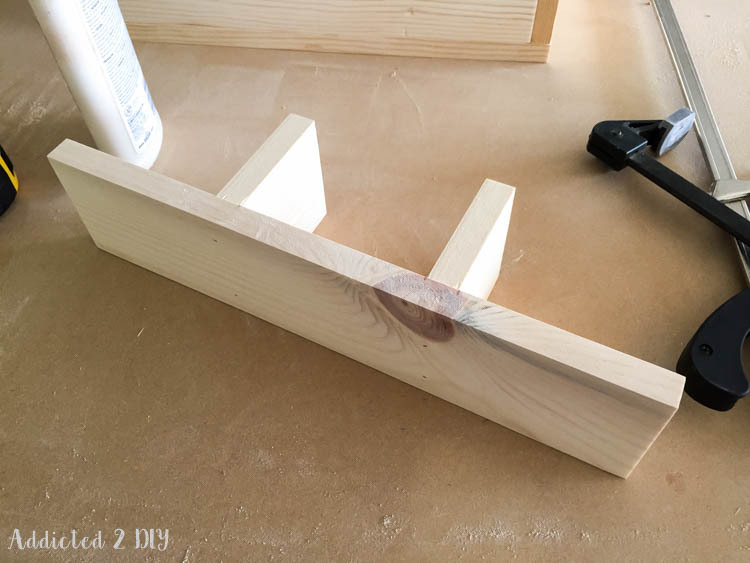 To hold the pipe handle, I drilled 1″ holes towards the top of the sides. I clamped the sides together and drilled straight through both of them. 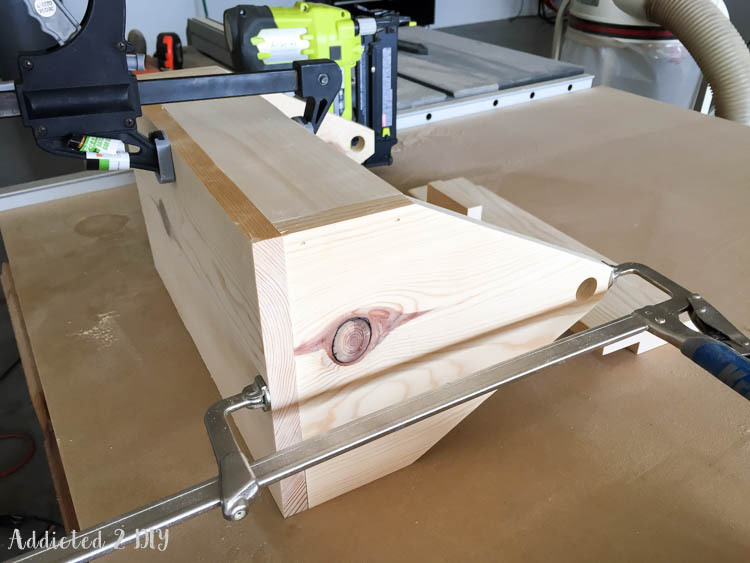 To prevent the wood from tearing out on the underside, you want to have a piece of wood underneath for the bit to drill into a little. 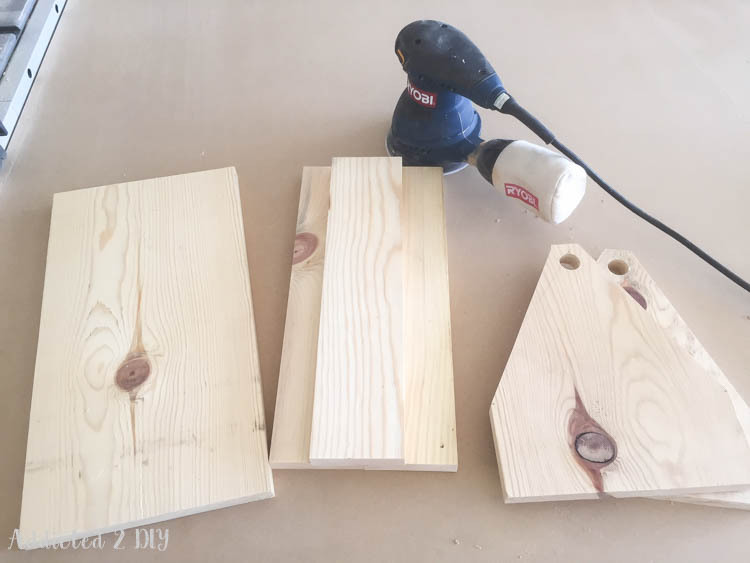 In this case, I used my plywood workbench top. It’s been used and abused, so I wasn’t too worried about it leaving a mark behind. 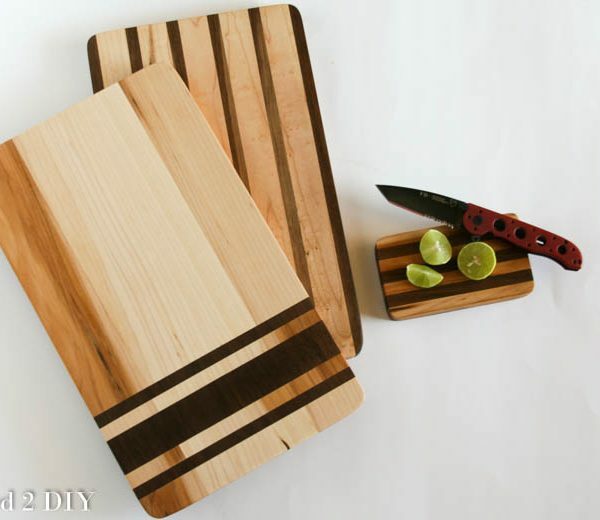 Once all of my pieces were cut, I sanded them down with 220 grit sandpaper. 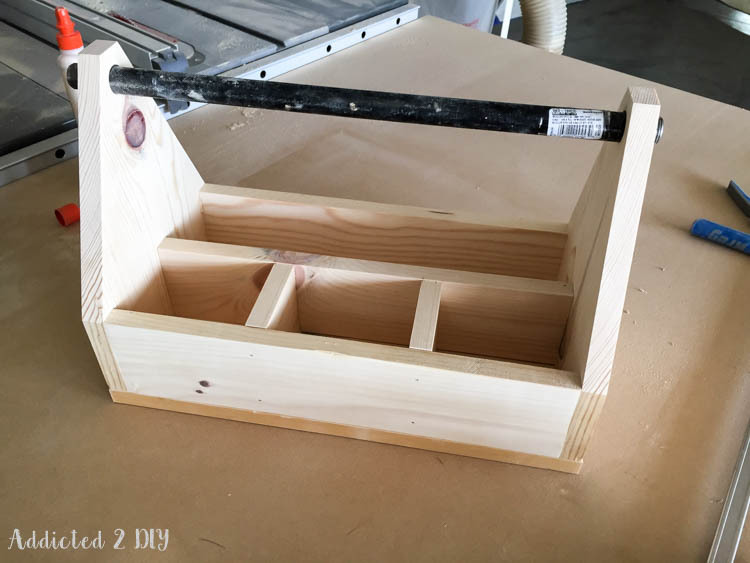 I began assembling the caddy using wood glue and 1 1/4″ brad nails. For the silverware divider, I evenly spaced the dividers along the longer 1×4 and glued and nailed them in place. 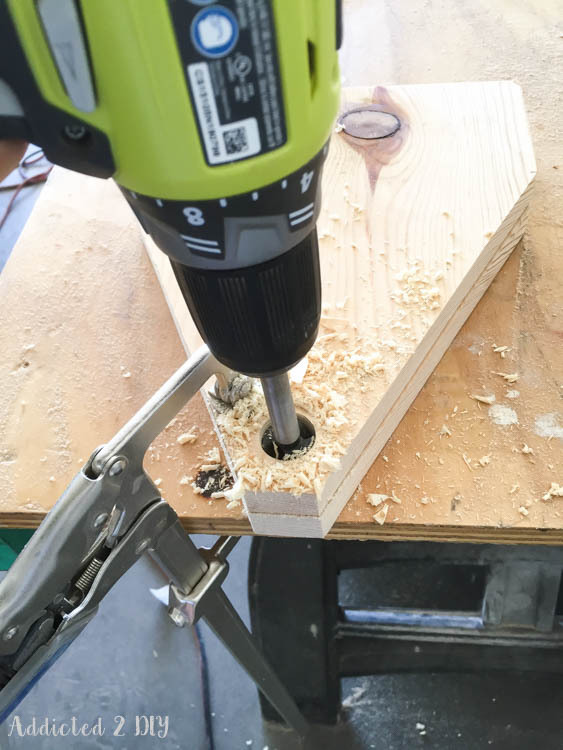 To nail the center divider into place, I found the center point of each side of the caddy and nailed 1 1/4″ brad nails through the sides and into the divider. I did the same to nail it from the bottom as well. Once the caddy was finished, I finished it off with a coat of Minwax stain in Golden Oak. 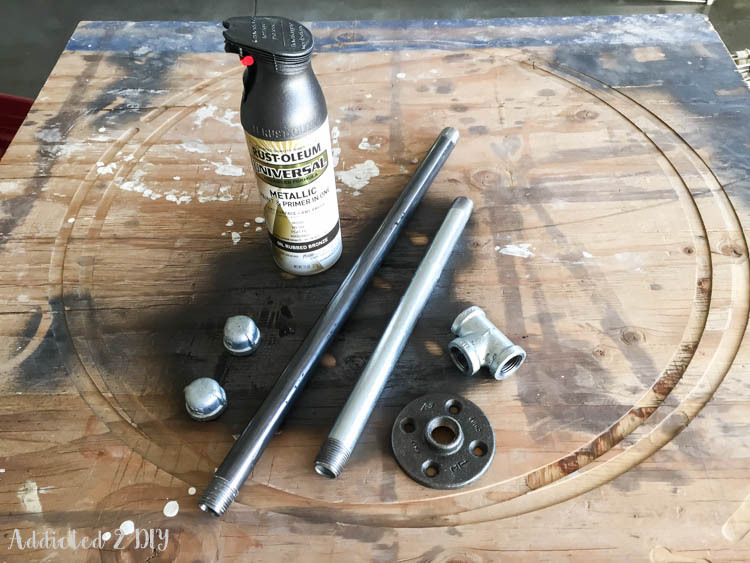 The steel pipe and fittings aren’t always the same color and I wanted to spray paint them in an oil-rubbed bronze color. 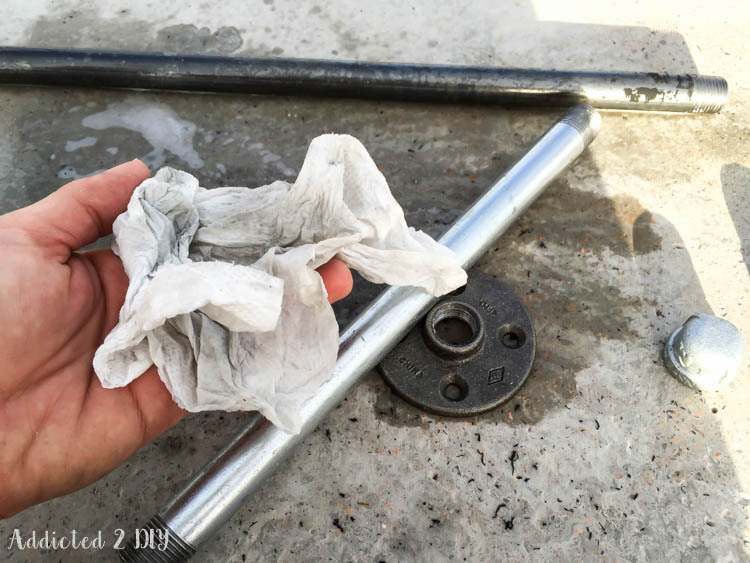 These pipes and fittings often have a greasy residue on them and the best way to get that off is to clean them with soap and water. I mixed up some Dawn dish soap and water in a spray bottle and used Bounty paper towels to help with the scrubbing. Again, all of these can be purchased at Home Depot, which I love! I always seem to run out of dish soap, paper towels, toilet paper, etc. 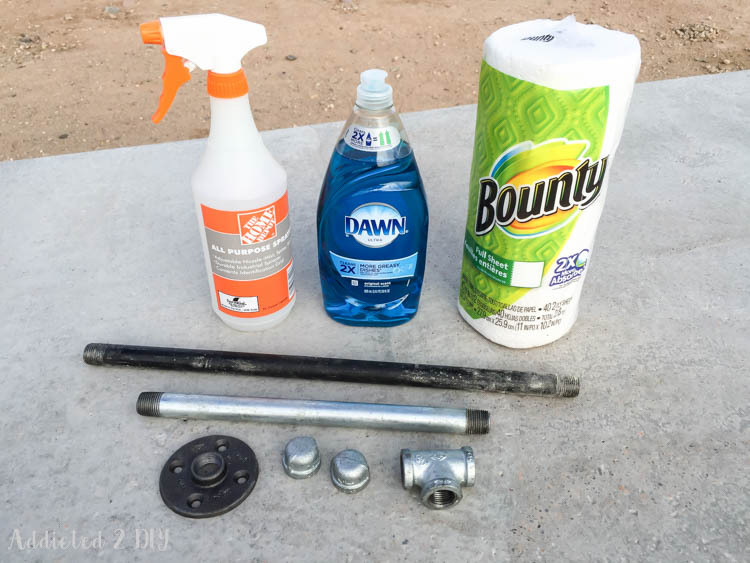 in between grocery store visits, and I’ve often picked these items up on my virtually daily trips to Home Depot. I sprayed all of the pipe and fittings, then scrubbed them down with the paper towel. You can see just how much grease and grime I got off of them. Once they were clean, I rinsed them off and dried them with more paper towels. 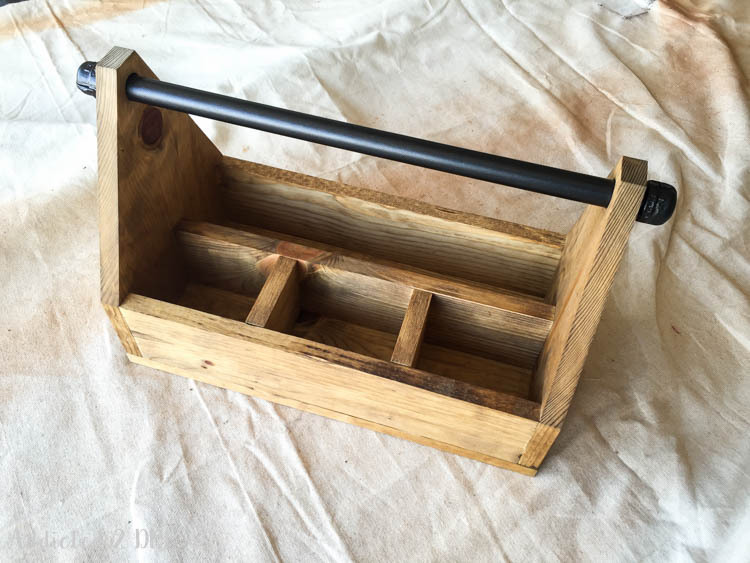 Once the stain was dry on the caddy, I added the pipe handle and screwed the caps on each end. 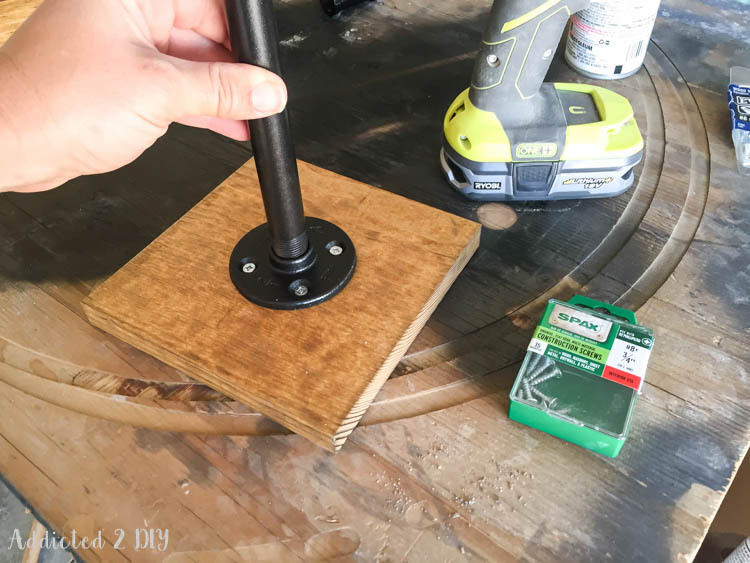 For the paper towel holder, I stained the square wood piece and then attached the pipe flange with 3/4″ screws. I screwed the 12″ piece of pipe into place and topped it off with the 1/2″ pipe cap. We rarely use actual napkins in our house unless it’s for Christmas Eve brunch when I like to dress up the table a bit. I prefer the simplicity of paper towels, especially the Bounty select a size paper towels. Whenever we need napkins at dinnertime, I just tear off a few of those! 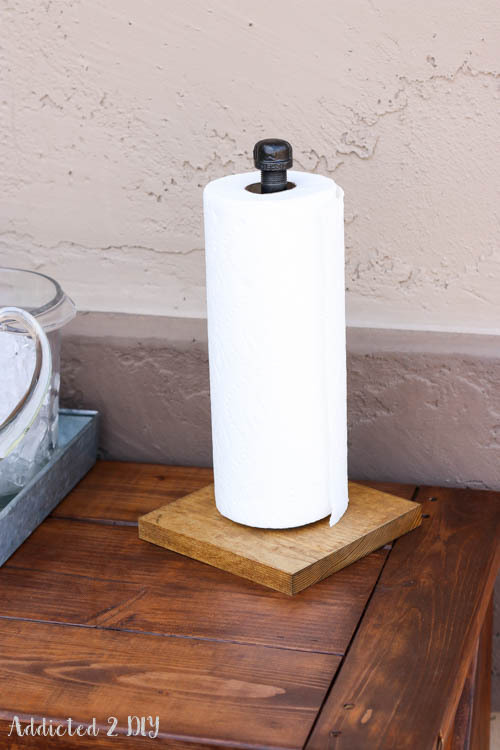 I knew having a paper towel holder on hand for our outdoor BBQs would be a great addition to traditional napkins. 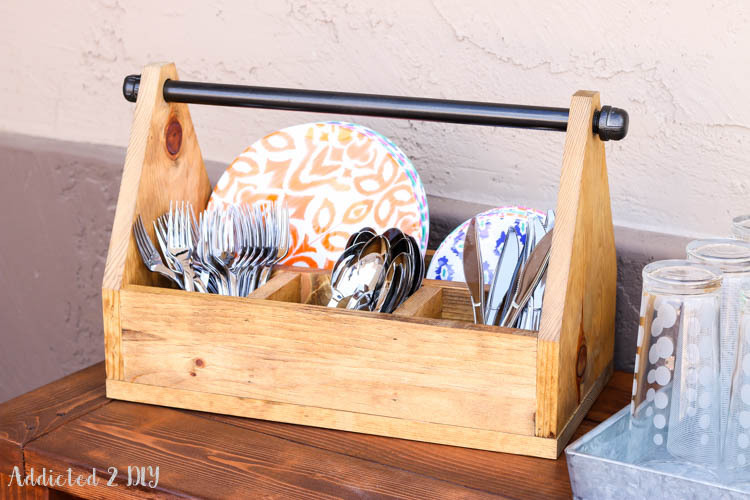 The dinnerware caddy is big enough to hold plenty of dinner and dessert plates as well as tons of silverware (or in this case, fancy plasticware). I hate the silverware caddies that never seem to have a space big enough for all of the spoons and forks to fit. We have friends coming over in a few weeks for a BBQ and I can’t wait to have a pretty setup for everyone to grab their drinks and food! 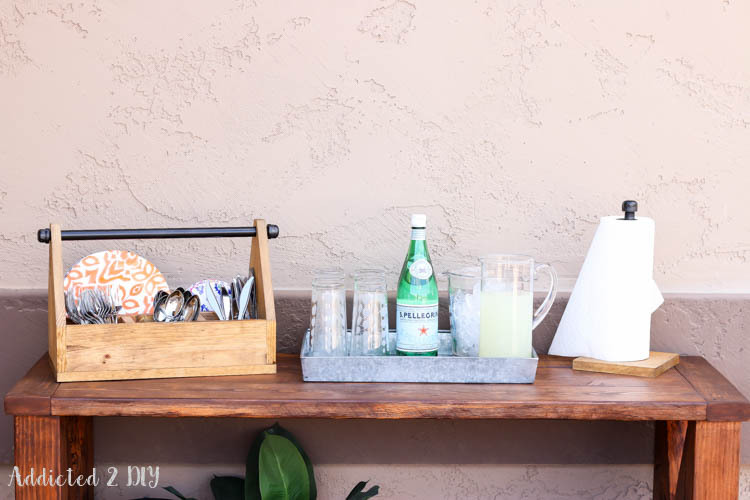 It feels so good to start updating our outdoor living space into a relaxing retreat that’s perfect for spending time with my family or entertaining with friends. Have you started any spring projects yet or anything planned? Are you ready for the giveaway? Just click here and take this quick and fun quiz! When you’re done, leave a comment below with the results you got and you’ll be entered to win the giveaway! Mine says I’m destined to create a shabby chic kitchen cabinet as a spring DIY. I think I might have to give that a shot! I can’t wait to hear what your results are! And don’t forget to get your coupons and special offers from The Home Depot! DISCLOSURE: This post is sponsored by The Home Depot and P&G. All ideas and opinions are entirely my own. For more information, please read my full disclosure statement. This is a sponsored conversation written by me on behalf of P&G, The Home Depot. The opinions and text are all mine. 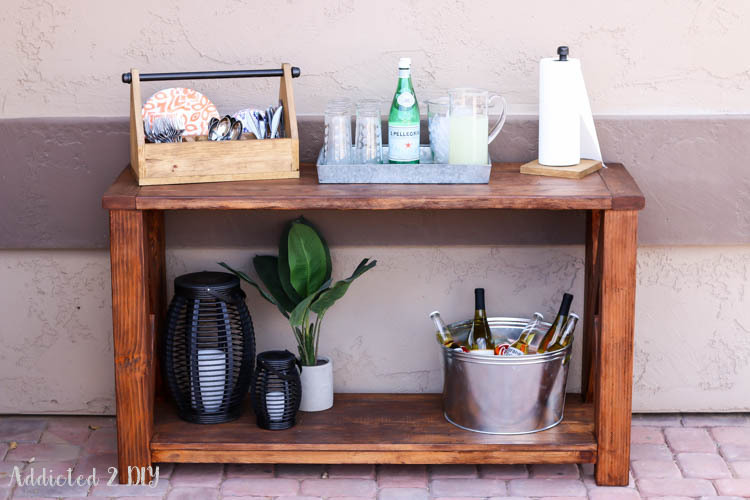 previous article: DIY Rustic Outdoor Console Table – Great Outdoors Challenge! Laundry room redo! Funny, that is actually on my to-do list. Looks like maybe I should move it higher on my list. I took the quiz and it told me to make a one-of-a-kind accent wall. I got laundry room re-do!!! Funny. I just told my husband I needed to re paint the whole room. Aaaannnnnndddd…… Maybe tear out a wall or two!!!! LOL. Thanks for the giveaway. Love your site. Take care. Oh he was!!! He just shakes his head, rolls his eyes, and sighs. He knows he has no control. Resistance is futile. LOL. I had a question for you. I want to make a towel rack and use pipe. Is there something I need to “seal” the pipe with so as to not discolor towels? I loved your suggestion to use Dawn to clean it. Love that soap. Not sure if I had to do something after cleaning. Thanks so much. Take care and happy building!!!! I always spray paint mine to make everything a uniform color. 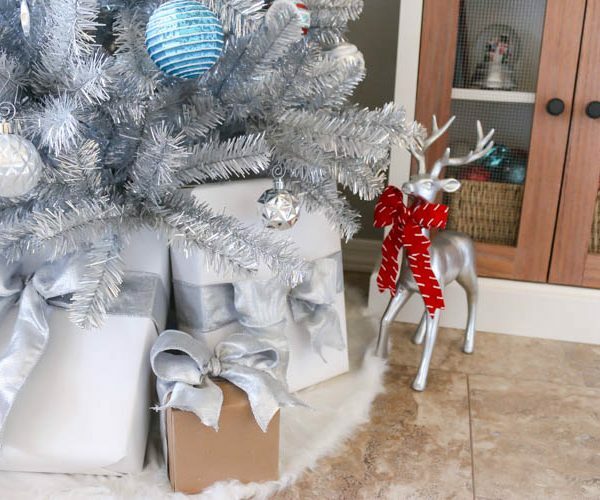 If you don’t want to change the color, you can always use a clear coat spray paint. This was fun and going to try it again with different combination. 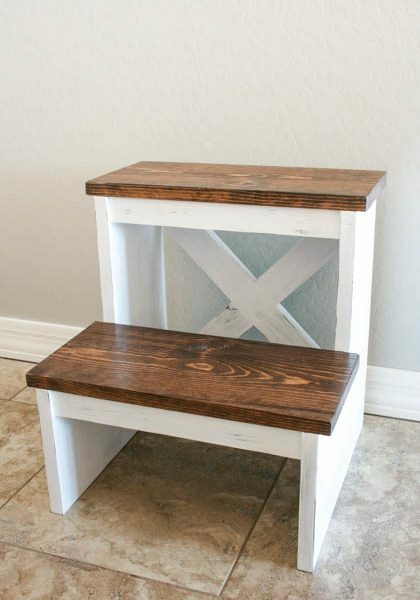 As a diy lady, we always have many projects going on in our head at once! First time, painted mason jars and second the shabby chic kitchen cabinet. I prefer the second. Laundry Room Redo. Not what I need to do right now, though! 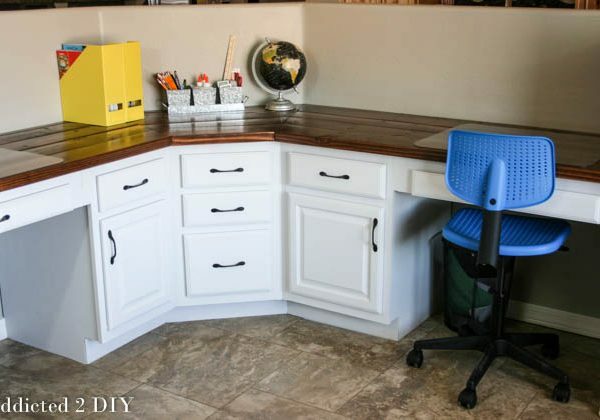 I scored the laundry room redo, which is accurate because we have that project planned this summer. My result is Painted Mason Jars. It fits because I’ve been in love with mason jars lately. My results are: Painted Mason Jar Vases. My results said I should do the painted mason jar vases project. It suggested I do a painted mason jars project which I think is a great idea! This is awesome! It looks really sturdy and well equipped to carry even heavy, ceramic dishes. Nice work! Thanks so much for the walk through! Thank you Morgan! I’ve even had a reader build one and use it as an electronics station. Definitely a ton of possibilities!